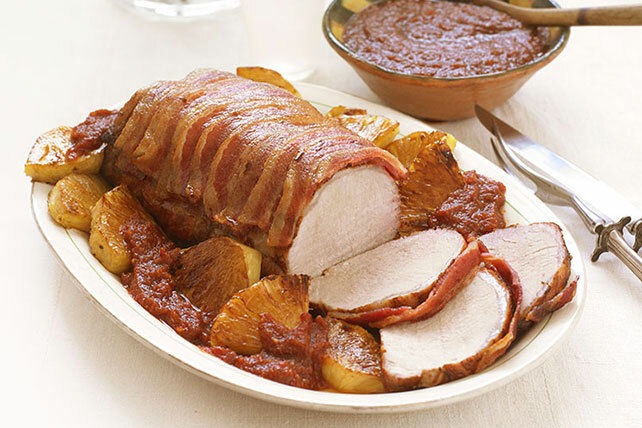 A smoky bacon wrap keeps lean pork loin moist and juicy while pineapple adds a flavorful twist to the mole. Cook roast in large skillet on medium-high heat 5 min. or until evenly browned on all sides, turning occasionally; transfer to roasting pan sprayed with cooking spray. Top with bacon, overlapping slices as necessary to cover top of roast. Bake 1 hour or until roast is done (145ºF). Meanwhile, cut 1 pineapple wedge into 12 pieces; reserve for later use. Chop remaining pineapple; place in blender. Add remaining ingredients; blend until smooth. Pour into saucepan. Bring to boil, stirring frequently. Simmer on low heat 20 min., stirring occasionally. Place roast on cutting board. Tent with foil; let stand 5 min. Meanwhile, cook pineapple wedges in skillet on medium heat 5 min. or until evenly browned, turning frequently. Slice roast. Serve with the pineapple wedges and mole sauce. Refrigerate any leftovers. Chop meat and pineapple, then toss with leftover mole sauce. Reheat, then serve wrapped in warmed flour tortillas. Substitute 2 Tbsp. dark brown sugar for the piloncillo.